Paralytic Shellfish Toxins (PST) are a class of neurotoxins which are produced by cyanobacteria and dinoflagellates which bloom seasonally in marine and freshwater environments. Currently, the most used method is the Mouse Bioassay (MBA) which poses ethical and resource challenges. Several Liquid Chromatography Tandem Mass Spectrometer (LCQQQ) methods have been developed, but matrix suppression effects remain a challenge to be overcome. 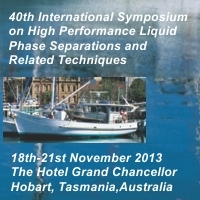 The work presented will focus on efforts to identify and characterise these extract components through LC-QTOF surveys and develop sample preparation and cleanup techniques for potential screening purposes with a Hydrophilic Interaction Liquid Chromatography Tandem Mass Spectrometer (HILIC MSMS) instrument. Trufelli H, Palma P, Famiglini G, and Cappiello A. 2011. “An Overview of Matrix Effects in Liquid Chromatography-Mass Spectrometry..” Mass Spectrometry Reviews 30 (3) (May): 491–509. doi:10.1002/mas.20298. Sayfritz SJ, Aasen SAJ, and Aune T. 2008. “Determination of Paralytic Shellfish Poisoning Toxins in Norwegian Shellfish by Liquid Chromatography with Fluorescence and Tandem Mass Spectrometry Detection.” Toxicon 52 (2) (August): 330–340. doi:10.1016/j.toxicon.2008.06.001. Diener M, Erler K, Christian B, and Luckas B. 2007. “Application of a New Zwitterionic Hydrophilic Interaction Chromatography Column for Determination of Paralytic Shellfish Poisoning Toxins.” Journal of Separation Science 30 (12) (August): 1821–1826. doi:10.1002/jssc.200700025. Botana AM, Otero P, Rodríguez P, and Alfonso A. 2012. “Current Situation on Analysis of Marine Toxins.” Reviews in Analytical Chemistry 0 (0) (November 23): 1–20. doi:10.1515/revac-2012-0020. Turrell E, Stobo L, Lacaze J, Piletsky S, and Piletska E. 2008. “Optimization of Hydrophilic Interaction Liquid Chromatography/Mass Spectrometry and Development of Solid-Phase Extraction for the Determination of Paralytic Shellfish Poisoning Toxins.” Journal of AOAC International 91 (6) (November): 1372–1386. Bing Cheng graduated from the University of Melbourne with a Bachelor of Food Science with Honours. He conducted his Honours research with the CSIRO Food and Nutritional Sciences division in Werribee. He is currently in his third year as a PhD student at Victoria University developing a method for the detection and quantitation of hydrophilic marine toxins.